I explained that we’re all equally loved by God. We’ve all sinned and messed up in some way. And we continually need Jesus. I went on to say that we don’t feel as if we’re better than they are. They deserve to know about the amazing love and forgiveness of God. I explained how many of those within prison are more open to the gospel than those on the outside. As he listened intently, he said, “Well, I just want to thank you, on behalf of all the men in here, for treating us like we’re humans. Thank you for what you do.” I was deeply touched by his grateful heart and the sincerity I saw in his eyes. He’d experienced the hurt caused by prison officials who saw him as an animal, unworthy of forgiveness, love, or a second chance. Society has branded him and he’s probably faced rejection from family or friends. Being human doesn’t mean being perfect, in fact, being human means we are a sinful, fallen being. None of us are worthy to be loved by God, yet we are. Deeply. Because, in spite of being sinful, we are also created in God’s own image. Each of us carry the Creator God’s mark of ownership. How amazing is that? When we hear of some of the crimes that people commit, it’s easy for us to think that this person isn’t even human. After all, how could a human being do something this horrendous? My friend, apart from us being closely connected with God, we are all capable of the same things. Those behind bars are just as valuable to God as you are, and they possess an eternal soul. Although they need to face the charges and consequences of their actions, they still need to be loved. By God…and by you and I. Love is the only thing that can reach and change them. I don’t know about you, but I’ve been guilty too many times of causing that same hurt to others. Of treating them as if they’re not as important as I am. It’s an ugly attitude, but we’ve all been guilty of it. The next time you or I are tempted to look down on someone with a belittling attitude or respond in a wrong way, let’s take care of the pharisaical attitude in our lives. The attitude that causes us to treat others as if they’re not quite human, while we raise ourselves to the elevated position above humanity. Since every person is created in God’s image, we should be loved and treated with respect. Not because we deserve it, but because we have the very breath of God within us. Think about it! God has breathed into each of us His own life giving breath…Including the tattooed and rough-looking men serving time behind bars. Including that person in your life you’re struggling to forgive and love. 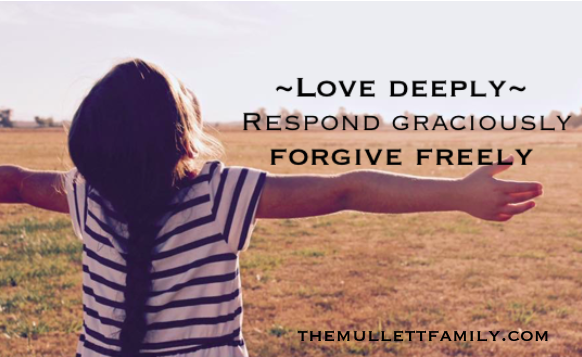 Reach above humanity and do the supernatural today…love deeply, respond graciously, and forgive freely.